We have a graduation stole in light blue with pink trim that is absolutely stunning. It just might be the perfect way to represent yourself during your graduation. As your graduation date grows closer and closer it is time to start assembling your graduation wardrobe. It has been a tradition for a number of years for graduating students to dress in a cap and gown for their graduation ceremony. Here at Honors Graduation we have convenient package deals that include all of the essentials that you will most likely be required to wear in order to walk at your ceremony, such as your graduation cap and gown. We also carry a large variety of accessories as well to finish up the rest of your outfit, making Honors Graduation the only place you'll need to go to be ready in time. It has taken years of hard work, overcoming every obstacle in your path to successfully meet your goal. As you accept your degree or diploma your family and friends will all come together to help you enjoy your celebration. Use our graduation stoles to signify the group or club that you are in. Here at Honors Graduation we offer stole customization. Using Embroidery, our customization team is able to add the wording or the image of your choice to your stole for a more personal final product that you will cherish for years to come. We have over 15 different color options to choose from for your stole as well as the trim, letting you mix and match to create your ideal stole. 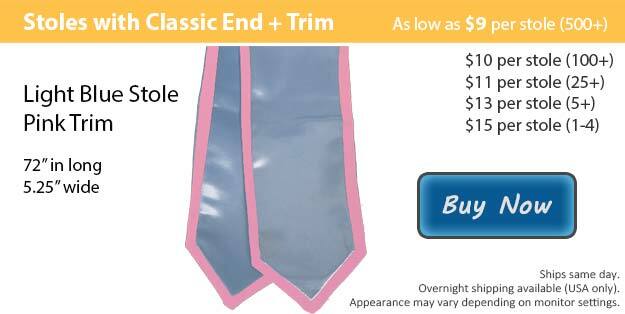 We have two styles for the finish on your graduation stole, either the classic option or our angled finish. Each option is available with or without the trim, allowing you to purchase a single colored graduation stole.